RCPW carries a wide selection of genuine Scag lawn mower parts. No matter what kind of part you need or what kind of repair you need to complete, we'll help you on your way, and you can be confident that you're always getting a great discount price on Scag mower parts. Are you keeping up on preventative maintenance? Is your Scag out of commission? We have both aftermarket and OEM Scag mower parts so you can go back to being the king of the jungle once again. We have been involved in the Scag mower parts business for many years and stock thousands of the most common parts so we can help you get back out there, and soon! Not sure what you're looking for? Browse all genuine Scag parts here. Scag makes a lot of mowers, so it doesn't matter if you have a Cheetah, Turf Tiger, Wildcat, Tiger Cat, V-Ride, Pro-V, Freedom Z, Liberty, SWZ Walk Behind, SW Walk Behind, SFW Walk Behind or STHM Three Wheeled Rider, we can look up your Scag mower parts for you and have them sent to your door! 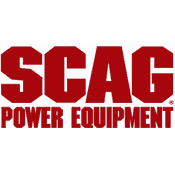 Scag Power Equipment uses some of the best parts and accessories available. They use the highest-grade steel and the best componentry to build a machine that is made to last for years. They have recently discontinued a few riding mower lines to introduce the Cheetah which includes a specialty suspension seat to make the ride on a Scag more comfortable. The V-Ride has many features that are common to most stand-on mowers but provides the quality and dependability that you can expect out of a Scag. In for something new? The new Freedom Z and Liberty models will get the job done at less cost. While we're not able to sell these products online, we can provide you with quality original Scag mower blades and aftermarket parts to get you back out there! Of course, you can always call us directly at 800.937.7279 with any questions, whether you need help with a repair or finding the right Scag mower blades for your model.